A career as a Corrections Officer can be very challenging and also rewarding. You may be wondering about a specific job description for corrections officers and that’s a very valid question. What is the Job Description for Corrections Officer? In essence, the position of a correction officer can be compared to a combination of social worker, counselor, and police officer. They work closely with and help an incarcerated population. Thousands of dedicated correction officers make a tremendous difference every single day. Inmates typically have longer stays in federal and state prisons than in county jails, As a result, correctional officers in prisons gain insights about the inmates such as security issues, and specific needs. Therefore, the work environment in state and federal prisons tends to be safer than in county jails. Correctional officers must have a high school diploma, or its equivalent. Corrections officers work in prisons, penitentiaries and detention centers. A number of state and local corrections agencies also require some college credits. That being said, military experience, or law enforcement experience may be substituted for this educational requirement. The Federal Bureau of Prisons does require that entry-level correctional officers hold a bachelor’s degree along with three years of full-time field experience that involved the supervision of individuals, assistance, individual counseling, or a combination of the two. Correctional officers must attend a training academy where they receive extensive instructions that teach them how to deal with situations that can typically arise on the job. Prospective corrections officers must also pass a qualifying exam in order to begin a career as an officer. 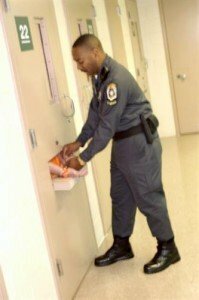 In order to qualify for Correctional officer screening, you will be required to provide documents such as a Social Security card, an original or certified copy of a government-issued Birth Certificate to prove that you are eligible to work within the United States. In some cases, a U.S. Passport may also be acceptable. What Subjects Are Covered In The Corrections Officer Exam? The exam questions typically cover grammar, reading, comprehension, memory, mathematics, situational reasoning, verbal reasoning, communication skills, and decision making ability, Most exams contain 100 multiple-choice questions, and the exam usually takes about three hours to complete. For the most part, the majority of exams are written exams, but some states, such as the state of Maryland, require a written exam along with video-based exams. Usually, the scores are based on a 100 point scale with 70 as a minimum passing score. Upon successful completion of the exam and the time spent at the training academy, officers are assigned to a facility where they receive on-the-job training. Specific qualifications vary depending on the agency, but all applicants must have a high school diploma, or its equivalent. There are agencies that also require work experience, or some college education. Corrections officers work in penitentiaries, prisons, and detention centers. Their responsibilities include overseeing detainees and prisoners along with maintaining the policies and security of their facility. Many officers are employees of the government responsible for the jurisdiction in which they operate. On the other hand, a very large number of officers are employed by private companies. Based on data from the United States Department of Labor, Bureau of Labor Statistics, compensation for the role is approximately $39,020 per year, or $18.76 per hour. The median wage is determined as the wage at which half of the workers in an occupation earned more than the median pay, and half of the workers earned less. Corrections officers can achieve job stability and benefits. According to the United States Department of Labor, the employment of correctional officers is projected to grow by 5 percent from 2010 to 2020. This growth is slower than the average growth for all occupations.